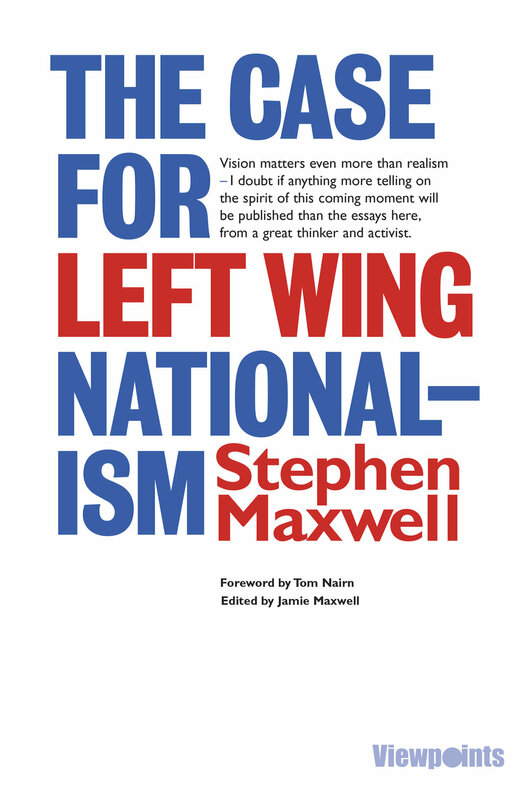 After the launch of Stephen Maxwell’s The Case for Left Wing Nationalism last week, his son and editor of the book, Jamie Maxwell, came in to have a chat about the new book, the politics it encompasses and his own feelings about his father’s lifetime of political work. He explains that his late father completed writing his first book, Arguing for Independence, and after his death last year Jamie continued the work, bringing the unfinished text to its conclusion and publishing it in partnership with Luath Press. He says that Stephen wrote the book because he wanted to provide a “very clear, concentrated account of the social, political, economic and cultural grounds for independence which he felt was missing from the debate – above all he was aiming for something clear and accessible”. Arguing for Independence was based on new material that Stephen wrote following his retirement in 2009, but it built on themes that he had worked on throughout his life, such as Nordic social democracy, defence policy, social policy and oil issues. Asked about his motivation for producing the new book of his father’s work, The Case for Left Wing Nationalism, Jamie explains that after Stephen’s death he started reading though his work and the more he read, the more he saw the potential to turn the individual texts into an “absolutely compelling” collection. He describes the eponymous 1981 pamphlet ‘The Case for Left Wing Nationalism’ as “one of the most compelling pieces of political rhetoric produced during the second half of the twentieth century in Scotland”. In the text, Stephen criticises the notion that the success of the Scottish independence movement depends solely on Scots possessing a sense of common national identity, advocating instead a less sentimental approach based on “an understanding of our shared economic and social interests.” Jamie applauds this “much more practical” attempt to advance the Scottish independence movement. Jamie reveals that the reaction to Arguing for Independence exceeded his expectations, as he was initially concerned that the density of the book would dissuade some people from reading it. He credits his father’s engaging style of writing for the fact that the book sold very well, as he was able to concentrate his formidable intelligence and extensive knowledge into an accessible text that appealed to a wide range of readers. Speaking about last week’s launch of The Case for Left Wing Nationalism, Jamie says he was “delighted” with the high turn-out and the speeches given by the “fiercely independent” panel of speakers, “none of whom, like my dad, are given to toeing the party line”. In his opinion, the carefully selected speakers provided a strong representation of “the critical engagement with the independence project” that Stephen Maxwell embodied. With regards to the future, Jamie mentions some essays that he is contemplating including in a future edition of the most recent book, as whilst he believes there is not enough of Stephen’s texts to create a new collection, “there’s certainly enough material to supplement the current collection of essays”. He admits that despite the time he has spent tracking down all of Stephen’s work, he believes there is still material out there that he is yet to find, which may prove a beneficial addition to his father’s existing publications. Discussing the wider political resonances of Stephen’s work, Jamie touches on Quebec and Catalonia, describing the relationship that Stephen had with René Lévesque, the founder of Parti Québécois and Jordi Pujol, the former President of Catalonia, both of whom he visited in their own countries and welcomed to Edinburgh in turn. Jamie himself expresses an interest in the Catalan independence debate and draws perceptive comparisons between the independence movements in Scotland and Catalonia, acknowledging the similarities and differences in the struggles. Stephen refers to the independence movements in both Quebec and Catalonia in The Case for Left Wing Nationalism and it is clear that his son has inherited these international interests. Ending the conversation on a personal note, Jamie expresses his belief that he has been “massively influenced and shaped” by his “engaged, articulate and intelligent” father, who he “admired a huge amount”. He says that it has “been a great joy editing his essays over the last seven months” because it has not only been a way of holding onto his late father but of also continuing the conversations that they had about politics. He celebrates the “unique role” that Stephen had “in the development of the SNP, because of his refusal to accept nationalist orthodoxies” and welcomes the opportunity that the books offer to share his wealth of knowledge and astute insights with readers across the world.